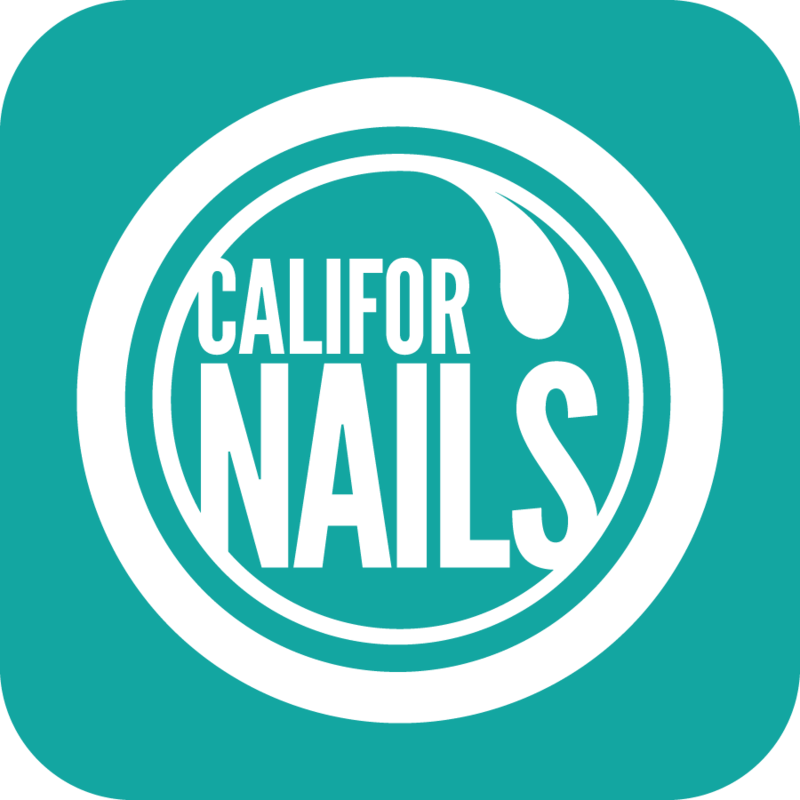 Californails: Nail Art Society: October Kit! 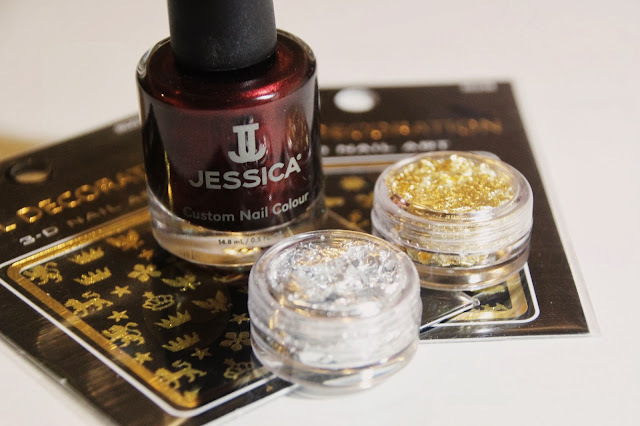 Nail Art Society: October Kit! So I was very impressed with Nail Art Society's kit this month! As one of their nail art gurus, I have been receiving their boxes since before their big revamp of the company. I feel like they've been constantly improving with time and I'm loving their boxes more and more. For this month's kit, its contents were actually packaged in a box and wrapped. As always, the first thing I saw were two cards containing information on the polish for the month and some designs created using the kit by one of the nail art gurus. When I unwrapped everything, I found all the products was contained in this lovely little black pouch. First off, I noticed a polish brand I had never seen before. 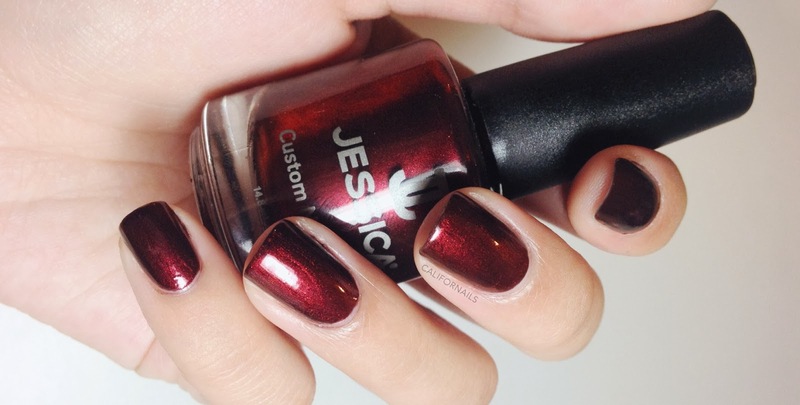 It's a Jessica polish in deep, shimmery red color named Cinnamon Kiss 734. I'm usually not a fan of shimmer polishes but when I swatched this onto my nails, I fell in love. I needed to layer a design over it for the first day of my October Nail Art Challenge but I really didn't want to! It took a couple coats to get it just right but it was super easy to apply. It's such a lovely shade and so perfect for fall! The next items were what I was really excited about upon opening the package. I found two sets of gold nail art stickers by Cala and two little containers of gold and silver flakes! Obviously they're not real but I'm so excited to create a design out of them. They look a little big so they can work for large designs on the nail and also be cut up to create smaller flake designs. The kit also included two 3D nail art packets from Ad Ro and include "Precious" and "Elements." One pack contains huge 3D crystal drops and the other contains gold rhinestones. I absolutely love this kit and am thinking of having a giveaway for it on my Instagram. 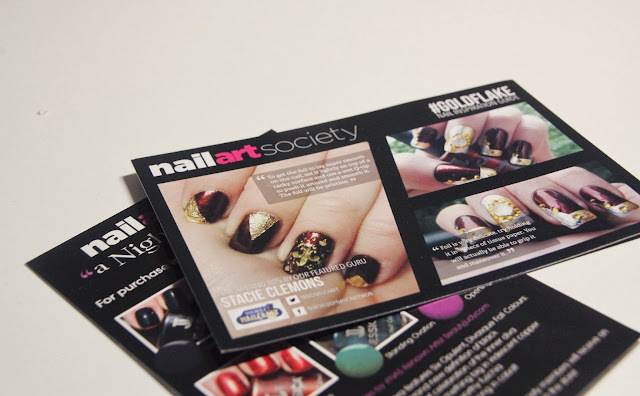 If you haven't checked out the Nail Art Society yet, find out more about them by checking out their website. They're lovely people and their kits honestly keep getting better and better every month.